This part of my blog was very popular last week. I will try and get it up by Sunday each week. What is interesting is, all the bidding seems to take place Friday and Saturday as the new auctions are listed, and then nothing till the following Friday when the auctions are ending. In the 5 days in between, nothing really moves. So you have plenty of time to think and strategize. You might also note that my pricing estimates were pretty good last week. Most notably with the Voyager hero costumes which all went under $ 1,500 as I predicted. The Romulan Senate robes also went in th $400 range as I said they would. I think bidders are being wise about the vast quantity of goods that It's a Wrap has. This week is a Deep Space Nine week with lots of great costumes from all the key cast members. I like when It's a Wrap does this on one hand, because it adds a nice theme and if you are a fan of a particular show like I am (I am a huge DS9 fan) you get to see much of what is out there. The top item so far is Sisko's commando style vest and uniform. Don't ask me why they call it that, but that is the name it has gotten (probably because of Christie's, which auctioned off the Picard). This was seen on Sisko in "In the Pale Moonlight" maybe one of the best DS9 episodes, where Sisko, working with the deliciously devious Garark, brings the Romulans into the war against the Dominion. If it wasn't for the fact that I already have the Sisko Black and Grey Command uniform I won at Christie's, and my best collecting friend wants it, I would go after it. Nice piece, but not as desirable as a complete uniform I think. If it had the Jacket to go with it it would be a gem. None the less, a nice piece from my favorite Captain. Second in the bidding so far is the best Klingon costume yet, as it has the boots. The two Klingon costumes that have sold so far had no boots. It appears that It's a Wrap wisely auctioned off the costumes without boots first, as many of us suspected. (Yeah, I actually said something nice about IAW!) Now they seem to be listing the ones that are more complete. This one has both the boots and a Klingon Comm Badge. If you are after a Klingon costume, these two items are important. I like this one and think it will display well. Considering that the two previous one went for $ 2,285 and $1,827 without boots or a comm badge, this one is probably worth about $ 3,000. If you get it around there I think you have a good deal on an iconic costume. There is also a female Klingon costume, which is certainly rarer. I would hesitate on this one, because it has no boots. Of course, this doesn't have the big cleavage that Lursa and Betor's costume did either! But if you are inclined to a female Klingon costume, this might be it. Don't go over $ 2,000 on this one. There are certainly more, and maybe better ones to come. Well, there are costume of all the DS9 regulars, including a Garak, which strangely never showed up at Christie's. Bashir, Dax, O'Brien, Quark, Rom, Leeta, Kira, they are all here. As well as lesser known characters such as Quark and Rom's mom! DS9 fans should have fun this week. But remember: There are more where these came from. Multiples of each Star Fleet uniform are to be expected, so don't go too high! The prop selection is a bit weak this time, with only two standout pieces. The DS9 Study Model is quite impressive. This thing is 6' wide! This is one of a small number of models built in designing the station. One sold at Christie's for for $1,800 before buyer's premium, but it was an earlier version that looked nothing like the final one, you see here. These are significant pieces of Star Trek history and I think this is a great item for someone collection who can display it! If you get this under $1,000 you have stolen it! I actually think it is worth more than that because of its historical significance. There is also a Romulan Disruptor Rifle, which is very nice, but could go high. The one at Christie's went for $2,000, but I would expect a $1,200 sale price here. Fortunately there is no reserve on this one. It is made of resin, which is important. Resin is a hard plastic that doesn't deform of degrade. There is a Romulan Disruptor Pistol also this week, but it is foam rubber. These weapons will tend to crack and the finish winds up looking crappy, so I always stay away from them unless you get them cheap. The Cardassian Circuit Panels went for $2,600 at Christie's, but should be a third of that this time. I mention Christie's prices as the high end of the spectrum. Items are generally going for 1/3 - 1/2 of what they went for at Christie's due to the smaller population of bidders here. I think this piece looks good and will display well. If you get it under $800, I think it is a good deal. If you are a DS9 fan, then the O'Brien and Bashir Dart Set is a great item. This is a piece we saw time and again in the show and helps define the relationship between the two DS9 crew members. A good deal at anything under $700. Well, it should be an interesting week, though with no block buster costumes or props. DS9 fans will be happy (as I am) and should get something they like at a reasonable price. The beauty of these auctions is that there is so much stuff, you just need to be patient, and you will get what you want cheap. Feel free to email me with questions or post a comment here! PLEASE include your email if you post a comment here if you want a response, as I don't always want to respond to individual questions on the Blog. The sixth week of the Star Trek auctions on eBay from It's a Wrap Hollywood ended with 92 of the 99 lots selling for a total of $68,883.85. That was the second highest total for these auctions since they began. It also represented the highest sell through It's a Wrap has seen, as this past week they finally wised up and minimized the number of reserves. The selection was maybe the best so far, and thus the auction results were very strong. The top item of the week was the Admiral Janeway costume seen being worn by the former Voyager Captain in both Star Trek: Nemesis and the Star Trek Experience Borg Invasion show. A beautiful piece, it sold for $5,100, the most yet for a Star trek item in these auctions. It was a stunning costume and probably one of a kind. Satan's Robot sold for $4,628.00, which was the second highest price paid for an item so far. The robot featured in the Captain Proton holodeck scenes, this was also a rare and dynamite piece. 23 items sold for over $1,000, which is second only behind the first week. If you ignore the first week as an aberration, because everyone was feeling out the auctions, then this past week was significant. However, the rarity of an item is becoming very important as costumes are coming down in price if they are perceived as common. While last week a background player costume Voyager style costume went for $449.11, a record low, this week Voyager costumes continued to plummet as star costumes went for unheard of low prices. The Doctor's uniform went for $1,425, a Tuvok went for $1,325 , a Tom Paris went for $1,358, and a Harry Kim went for $1,225. Even the rare Tuvok dress uniform went for only $1,528. This shows that people know there are lots of these uniforms out there and they aren't that rare. Now props continue to sell high. An Enterprise E console sold for $3,500, a hero Tricorder went for $2,560 and a Dr. Phlox faux blood draw kit went for $2,025. These were all strong prices for props. Overall, props are doing well, and getting good prices across the board. Few props sell below what they should. There were some nice costumes this past week. One costume of note was the Commander Madden from Star Trek: Nemesis. Madden was Riker's replacement as first officer on the Enterprise when Riker takes over the Titan. It went for a strong $2,650. The corresponding "Helm Officer Branson" costume went for $1,635. What is amazing, is that a background operations costume of the same style went for $1,525! These costumes are exceptionally popular, and very attractive in person. They continue to get high prices for background costumes. In fact this background costume went higher than all the aforementioned Voyager hero costumes! Of course, it just wouldn't be an It's a Wrap auction without some crazy reserves. The good news is this week has less reserves than any other week. But predictably, IAW set reserves on some items based on the high prices realized at Christie's. Two Phaser Rifles didn't hit reserve, and one hit $2,025! Based on the extremely high prices IAW is asking for similar rifles on their web site, one can assume the reserves were set in the $4,000-5,000 range. Prices they will never get online. Also, the Romulan Senate stools were a hot item at Christie's, selling for $800 each (not including the Buyer's Premium) in a set of six. Here the top bid was $1,036 for two, not hitting the reserve that was probably at least $ 1,600. As usual, we will see these items come back in later weeks without a reserve. Best Buy of the week: Doctor, Tuvok, Paris and Kim costumes, all under $1,500! Worst Buy of the week: 24th Century Starfleet Carry Case $1,503. Are you KIDDING me?? Sleeper of the Week: Female Q at $560. Suzie Plaxson as the female Q in Voyager. Great price, memorable role. Special thanks to Aaron Carlson, who every week, compiles all the stats on that week's auctions. He does a great job, and has a nice Star Trek collection which I will be featuring in the blog real soon. I have decided to start a new part of this blog by previewing each week's auctions and giving my feedback, and the feedback of my collector friends, on the current week's auctions. Hopefully this information will help you make good decisions on the items up for bid. In addition, it gives collectors a chance to ask questions in the comments section that I will answer to help you in your Star Trek collecting. Ok, this is the creme of the auction and already, on Saturday, at $5,100, making it the highest priced item to sell so far, as there is no reserve. I know that the bidder has set his eye on this and this item will certainly go for over $ 6,000. It is stunning and a great piece. This is the uniform that Janeway wears in Star Trek: Nemesis when she orders Picard to Romulus. There are few collectors bidding on the auctions on IAW that will go after this, but it will look good wherever it lands. OK, why are there two of these in one week? Does that make ANY sense? Geez, these guys constantly baffle me. That being said, these are both nice "Nemesis" style Type III Phaser rifles. One has a working flashlight and the other does not, currently reflected in the differing prices. There are reserves on both, which, knowing IAW, is probably in the $ 4,000 range. They still think they can get what items went for at Christie's. Now at Christie's a "Hero" version of this rifle went for $ 8,000 before buyer's premium. It had the flashlight and retractable strap, which is indicative of the "Hero" versions. A lot of 4 resin, non-hero versions went for $ 6,500, or $ 1,625 each before buyer's premium. IAW simply doesn't tell you enough about the condition and features of each prop. So based on the current market for Phaser Rifles and what they went for at Christie's, I think these are probably worth $ 4,000 each. Their provenance is without question and they appear in good shape. I am simply not sure the eBay market will bear these prices, which is more than any prop has gone for so far. There are two "Nemesis" costumes of note. The first is the Commander Madden uniform. Madden is the first officer taking over for Riker at the end of "Nemesis". Nice uniform with a Comm badge and rank. I would guess this one goes in the $ 2,000 range. The other is a Reman costume, which I think is gorgeous and will look great on display. Judging by recent auctions, and the fact that the Xindi costume, which is based on the Reman costume went for $1,200, I think this will go in the same price range. In addition, there are several Romulan Senator robes (there should be a bunch...look at that scene in "Nemesis") which would be a nice get as I think they go cheap. Don't pay over $ 400 for these. There are also two nice Romulan Fleet Officer uniforms. Now these are not nearly as nice as the hero ones (The Commander Donatra one that sold at Christie's was STUNNING and I am hating myself for not winning that during the Christie's auction). The Hero versions were custom decorated, while these are just screen printed it appears. I have always liked the Romulan uniforms, all the way back to TOS. This is the Nemesis/Voyager week and almost every major Voyager character has a uniform in this week's auction. There is a Seven of Nine stunt costume, a Tuvok dress uniform, a regular Tuvok, a Chakotay, a Paris, a Kim, a Doctor, a Kes and a distressed Janeway. The thing to remember about these is that there are a TON of each of these. Think of it...7 seasons for which they probably made at least 3 each season. That is over 20 copies of each! At this point in the life cycle of these auctions (remember, there are at least 6 months of auctions) I wouldn't pay over $ 1,500 for any of these, and less fo rthe Janeway and Kes. I am buying a Doctor from a friend for $ 2,000 WITH a comm badge. That should tell you where the market is. This is a long auction and I know many of us would be amazed if there aren't a lot more of these to come. And if you are looking for something unique, look at the Captain Braxton future Starfleet uniform from Voyager. The "Satan's Robot" is an awesome prop and I will tell you I am going after it in hope of snagging the Captain proton costume if it ever comes up. It is really cool, especially for fans of the Captain Proton episodes. The Dr. Chaotica costume went at a Profiles in History auction a few years ago and the Janeway "Bride of Chaotica" costume went at Christie's. The Compression Phaser Rifle is nice, but it is rubber and I HATE rubber props. They crack and the paint flakes and in a few years they look like crap. Speaking of which, when you see Borg and Hirogen costumes BEWARE. They are made of latex which breaks down. I had a discussion with a former Hollywood model builder who said he wouldn't collect any latex costume because of the way they break down. Now, these have gone at reasonable prices it seems, but please beware of the problems and know you will have to take good care of any latex costume. The Romulan Senate stools are beautiful, but went for INSANE prices at Christie's, so expect an absurd reserve from IAW. I doubt any of those will hit reserve. If you search the It's a Wrap auctions as I do (click here), you should look on page 2. The second 50 items are all $ 100 or less as of Saturday night. There are some props that will go cheap and some costumes you will be able to get at good prices as they are not main characters. If you aren't a big collector, and more a fan, there are some bargains to be had there. Feel free to email me with questions or post a comment here! Week Five of the Star Trek auctions on eBay from It's a Wrap Hollywood ended with 82 of the 100 lots selling. 18 lots didn't hit the reserve price. It was a good week as there were many interesting items up this week, including costumes from Star Trek: The Motion Picture and a slew of cadet uniforms from the movies, Next Generation and Voyager. The top item of the week was the Seven of Nine Jumpsuit which though it was bid up to $ 5,032.99 didn't hit reserve! This was just another example of over-estimation of the potential price by It's a Wrap. The costume was without the inner corset or the shoes. Anyone who knows Star Trek costumes will tell you that makes this costume incomplete. Two items have now gone over $ 5,000 in the 5 weeks of these auctions (the other being the Phlox Space Suit), and neither has reached reserve. Maybe It's a Warp doesn't realize the rich people who were bidding at Christie's are not bidding on eBay. What is really interesting is that only 11 items sold for over $ 1,000. That is the lowest total since the second week (during Christmas) and shows a trend we have seen for the last two weeks of common items decreasing in price. This will only continue over the next few months as the people who want the costumes get them and prices keep falling. Already some of the top collectors who I talk with each week have told me they are being very careful with their budgets as they are "pacing" themselves. You simply do not see the emotion and auction hysteria you did at Christie's. In fact a Starfleet Voyager style uniform went for $ 449.11, which is the lowest price yet! A real Star Trek uniform for under $ 500 is a steal, but you will continue to see this. None the less there were some interesting pieces, with two great Star Trek: The Motion Picture costumes, two of the very desirable Star Trek II style red officer uniform jackets from the movies and rare Starfleet Security Officer costume from Star Trek III, which sadly did not hit whatever absurd reserve It's a Warp set. There was also an outstanding Vulcan Musician costume. The fact that neither the Seven of Nine nor the Starfleet Security Officer uniform hit reserve shows a lack of strategy on the part of It's a Wrap. Faceman99, the high bidder on the Security Uniform, said "I will just wait till they put it back on eBay without a reserve as they have done with the previous items not to hit reserve". At this point, regular bidders know that an item that doesn't hit reserve will show up two or three weeks later without a reserve. So what is the point of the reserve in the first place? After lengthy discussions with some top Star Trek collectors and analyzing the past few weeks auctions, two trends are clear. First, there is a limited pool of money out there and people are being careful what they bid on. I think this also speaks to people who bid a lot early and were no where to be found this past week. Second, prices will continue to decline, both due to this and the fact that there are lots of duplicates of costumes and people are starting to see that. Why over-pay, when you can wait and get the item when it comes around again? This week is clearly the best week yet. It is a combination of Voyager and "Nemesis" items and features over a dozen "Star" costumes. The biggest item being the Admiral Janeway costume from Star Trek:Nemesis, which is already up to $ 5,100! Also, every main Voyager character is represented. And my favorite piece is the Robot from "The Adventures of Captain Proton", Tom Paris's holodeck program. It is really a classic piece! So what did I win this past week? Well, I got a feature film enlisted crewman jumpsuit that I have wanted for $ 810. It was a good deal on this jumpsuit and a very similar one went for the same price a bit earlier in this week's auctions. I also won the Future Cadet jumpsuit from Star Trek: Voyager, which had a comm badge on it, making it a steal at $ 535. Gems like this are becoming more common as prices come down. The fourth week of Star Trek auctions on eBay from It's a Wrap Hollywood ended with 75 of the 100 lots selling. 25 lots didn't hit the reserve price. This was an interesting week because it was an almost all "Enterprise" week, with every item in this weeks auctions being from Star Trek: Enterprise. But it also was a week when It's a Wrap decided to put reserves on more auctions than ever, obviously not learning the lessons of the past week, when items that didn't sell with reserves in week 1, sold without reserves in week 3. No item better exemplified this than the "Phlox" space suit from "Enterprise", which failed to hit reserve and went unsold at $ 5,600 . Now four of these sold in the Christie's auction (Archer and T'Pol for $ 8,000 and Reed and trip for $ 8,500), and I am sure It's a Wrap thought they would get the same for this one. The reserve was likely $ 8,000 or so based on It's a Wrap setting reserves based on Christie's sale prices. Now, if there was no reserve, the item would have sold for $ 5,600, which wouldn't be bad, considering Phlox is not as important a character as any of the ones that sold at Christie's, and there is simple not as big an audience now bidding on these items. Actually, the space suit might have sold higher. I would have bid $ 6,000 easy on it if I didn't think there was an $ 8,000 reserve. These suits are MAGNIFICENT. I have seen the T'Pol, which Stephen Lane of the prop Store of London has on display. When it comes back on eBay (which it will of course), I will be going after it. Again, the background player costumes that are from TNG, are selling at insanely high prices for non-named actor costumes. This week a red one sold for $ 1,994 and the costume didn't belong to any main character! It was a background player costume. These items seem to be the most in-demand items in the auctions. The Hoshi Sato at $ 1,800 was reasonably priced as was the Enterprise Phase Pistol and holster at $ 1,526. At Christie's these Phase Pistols went for $ 3,600 before the buyer's premium. Rounding out the top 5 was a model of the runabout \s engine pod from DS9 which went for a respectable $ 1,353. Now what was really interesting, is that a Terran Empire costume that went for $ 2,225 the second week, only fetched $ 1,000 two weeks later! And the Enterprise jumpsuits that were selling for $ 1,625 and $ 1,575 in Week 1, sold for $ 1,099, $ 910, $ 831 and $ 810. The trend is obvious and not good for It's a Wrap, which surely has many more of these. The highest priced item not to reach reserve was the Phlox Space Suit at $ 5,600. After that, a Maco jumpsuit only reached $ 560 and didn't hit reserve. A Klingon Rura Penthe guard costume and two Andorian costumes also hit just over $ 500 each and they didn't hit reserve either. Frankly, any reserve higher than $ 500 for costumes like these is really unrealistic. And the fact that there is so little interest in them means the audience on eBay is limited and without unlimited funds. One of the highlights of this past week, which many collector's missed, was the T'Pau costume from "Enterprise". T' Pau was an important character from the Original Series episode "Amok Time". And her costume from that episode went for $ 45,000 at Christie's. Here the one from Enterprise (granted about 40 years younger than its predecessor's) sold for only $ 1,225. It is a significant costume from an important character in Star Trek lore. This week may be the most interesting week yet. Already a Seven of Nine costume is up to $ 2,900. And there are many costumes from Star Trek: The Motion Picture. A Guard costume from Star Trek III is a really nice and rare costume (only scene in that movie). It is missing the belt and has the wrong insignia, but none the less, very nice. There are many great costumes, but not a lot of great props this week. I finally got to display my Sisko and Kirk costumes that I won at the Christie's auction. I bought half-forms and stands just like Christie's had. They look great. Here are the uniforms as they are displayed in my living room. It's a Wrap Hollywood eBay auctions, Week 3 results The third week of Star Trek auctions on eBay from It's a Wrap Hollywood ended today with 84 of the 99 lots selling. 15 lots did not sell because they did not hit the reserve price. Several items from the first week that did not sell because they did not hit reserve were re-listed this past week. And while many hoped this meant that It's a Wrap had learned its lesson about Reserves, those collectors were let down when the week 4 listings came out with more reserves than ever. Having talked to dozens of collectors about the auctions, I can tell you that the constant reserves are the only real source of discontent about the It’s a Wrap Auctions. The fact that two Klingon masks, one of which was listed week one with a starting price of $ 2,000, sold for just under $ 600 each, shows that It's a Wrap greatly over-estimate's the value of some of the items it puts reserves and high starting bids on. 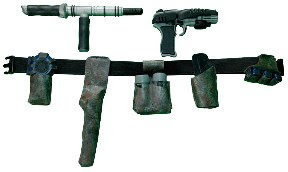 The MACO Assault Kit, an item that went for $ 3,800 (before reserve) at the Christie's Star Trek auction in New York, topped this week's auctions at $ 2,425. This is the perfect example that it is unrealistic for It's a Wrap to expect to get Christie's prices for expensive items . Some items, notably the background player costumes that are from TNG, are going at crazy prices, but overall, the prices realized are less than those realized at Christie's. This is clearly because the Christie's auction drew a crowd that was not just collectors, but fans as well. Here on eBay, the people viewing the items are collectors for the most part and you won't see crazy prices for most items. Of course, then you see that someone paid $ 2,031 for an Engineering PADD. Now it was a light up model, which is kind of rare for anything before Entrerprise, but it seems to have sold for twice what it should go for. This and the fourth highest item of the week, the Next Generation yellow command uniform, which went for $ 1,921.89 prove that some people are willing to pay way too much for some items. The Dax DS9 black and grey costume was a steal at $ 2,030.25 . Some collectors have been paying high prices for the very desirable black and grey uniforms which have been selling at about $ 2,000 in the eBay auctions from It's a Wrap, easily twice the price a background costume of this type should normally go for. Dana Hammontree, the winner of the Dax uniform said "That is a good price for that uniform. It is about what it should go for now that there are so many available." Hammontree, an experienced prop and costume collector feels that the prices have been too high for props, as in the Christie's auction. "The costumes are pretty much going where they should, with the exception of the background player costumes, which are really insane". Rounding out the top five items was a Klingon Warrior costume which went to Filmwelt_Berlin, the collector for Germany who has bought many high ticket items, both here on eBay and at Christie's. It didn't have boots, which made it somewhat incomplete. But the price was right at $ 1,827; less than half of what the lowest priced Klingon Warrior costume went for at Christie's. The highest priced item not to reach reserve was a Star Trek: The Motion Picture "Scotty" shirt that was the subject of much discussion. This shirt was never worn by James Doohan in TMP. And the fact that it has the wrong rank insignia is suspect. Yet it has Western Costume tags that have Doohan's name. Speculation is that this might have been made for "Star Trek: Phase II", the aborted second TV show that became the Motion Picture. This seems to be the most reasonable explanation. Whatever the case, the reserve not being met is ridiculous. The item is simply not worth that price considering its dubious provenance. The other pieces that did not hit reserve were not premium items, though the Cardassian costume was nice. But a reserve over $ 1,000 for it is not reasonable. Another 100 auctions have been listed by It's a Wrap Hollywood this week. This week it is all Enterprise items, with a Phlox Space Suit being the premium item (and already up to $ 4,550 on Day Two!). I didn't win anything this past week as there was nothing that really excited me. I love the Space Suit this week, but those went for $ 8,000 before premium at Christie's!